Sept. 19. 1939 the meeting was held with Mrs. Gregson. Minutes of former mtg. approved. Voted to pay bill of 50 cents for freight. all officers and superintendents of divisions were reflected for the year 1939-1940. adjourned, Ada Park-sec. 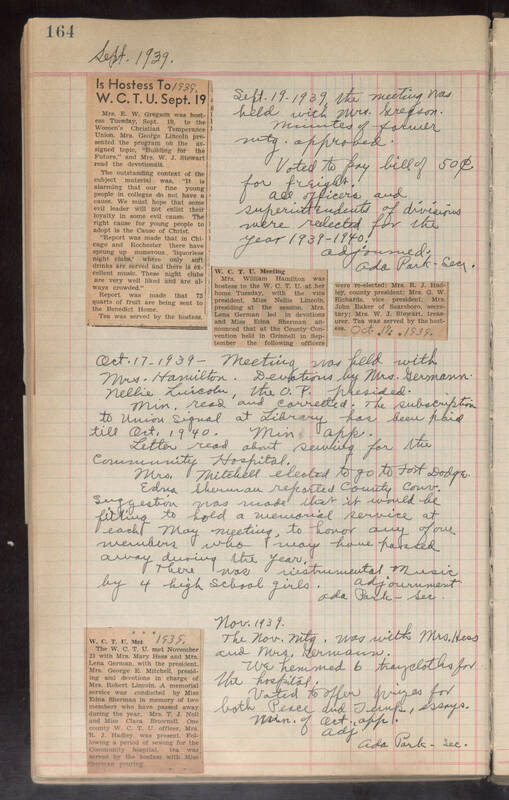 Oct. 17-1939- Meeting was held with Mrs. Hamilton. Devotions by Mrs. Germann, Nellie Lincoln, the V.P. presided. Min, read and corrected. The subscription to Union Signal at Library has been paid till Oct. 1940. Min app. Letter read about sewing the community Hospital. Mrs. Mitchell elected to go to Fort Dodge. Edna Sherman reported County Court. Suggestion was made that it would be fitting to hold a memorial service at each May meeting, to honor all of the members who have passed away during the year. There was instrumental Music by 4 high school girls. adjournment, Ada Park-sec. Nov. 1939. The Nov mtg. was with Mrs. Hess and Mrs. Germann. We hemmed 6 tablecloths for the hospital. Voted to offer prizes for both Peace and Jessup. essay min. of Oct. app. adj, Ada Park-sec.